Recently, I was asked by my online publisher, http://www.escapeartist.com/, to pen a travel thingy about how we celebrate an Irish Christmas over here. I thought and thought - and the more I thought, the more I wanted to do something a little different. The result is a story about my Irish friend, Ann McGoona. But she couldn’t say it because she was dead. She was dead of cancer at the age of fifty-four, only a few days before Christmas. Ireland at Christmas is a magical place. It is a time for family and friends; of kith and kin. Yes, it is much more commercial today than it was when I came here half a lifetime ago. But some of the traditions remain untouched. On Christmas Eve, we still light a candle in the window to welcome the Christ Child. Wives – and yes, these people are usually housewives – still mix the Christmas Pudding in an immense bowl, kneading the suet, breadcrumbs, mixed fruit and Guinness together until it’s just right. Then boiling in a pot for hours on end until the house smells like a baker’s. And finally pouring the Irish whiskey over it until it has just the right potency. Christmas in Ireland is a time for children, which means that it’s a time for everyone because almost all of its populace are children at heart. And on Christmas Eve, the entire town of Navan still marches down to Mass, and within the draughty church that’s as old as the history of the town listens to the priest retell the story of a child born to a woman, and of His message of hope that was a precursor to his later dying. Just as Ann had died. On that almost Christmas night eight years ago, Ann chose to have herself laid out in a simple wooden box and placed in her parent’s front room. That house was tiny by American standards, and the crowd that came to celebrate Ann’s life could not possibly fit within its four walls. Instead, we gathered outside in the frosty narrow laneway and waited our turn to file past Ann. Inside, her family gathered at her head; a priest in attendance. And when it was my turn, I did what everyone else did: I entered the house to say goodbye. I picked up the fragment of fir tree, touching its silky needles into the bowl of holy water, brushing the droplets gently onto Ann’s forehead. Then, like the others, I walked outside to wait. As I waited I looked up. 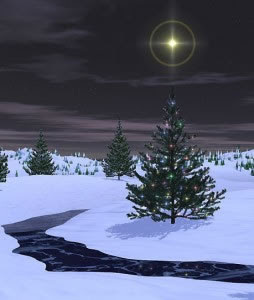 On that almost Christmas Eve, the stars glittered overhead. A small mist gathered gently above the row of terraced houses, as if a ghostly wreath. In neighbours’ windows, candles were lit, only this time to say goodbye to a friend that they knew held no wrong. And then as I waited, the bells of the local church began to sing. And their song was Silent Night, Holy Night, and for a moment I thought of Ann and the friendship that she had for this Yank who was so far from home, and I knew that I would remember that night and that Christmas for as long as I lived. © Tom Richards and Storylines Entertainment 2009. Tom Richards was born in Chicago but has lived in Ireland since 1982. He has no Irish blood in him whatsoever. Trust me! He is also the author of A Survivor’s Guide to Living in Ireland, a bestseller on www.escapeartist.com. She sounds like a marvelous person and a real character... I am sure she would be pleased to be so fondly remembered by you. What lovely Christmases you have described (well, not about your friend passing at Christmas) but just the warmth and friendship and traditions. Makes me want to rush over there next week and find a small town. But I will have to make do with my mig city here and try to get more warmth and peace than usual right here. I hope you have a Happy Christmas.. and one with no rain. One of the good things about the Internet (and there are many not-so-good things too) is that you can, if you are talented, post a tribute such as this and gain a wide audience. Ann sounds like a wonderful person, and I'm happy for you that you got to know her and were able to share a wee bit here. Merry Christmas to you and yours, and thanks for the site! as long as she is in your memories, she will never be forgotten, very moving story. That's a lovely story - I can see her in my head, such a typical( in the best sense of the word) Irish lady. It sounds like she taught you a lot about the Irish sense of humour! Hello to you from across the sea. I live in Washington State in the USA. I was searching for an interesting Irish blog and found it here. I very much enjoyed reading your Christmas stories. My Fitzpatrick Ancestors came from County Meath so occassionally my Irish DNA blooms and I need a fix. You wrote about the Irish Christmas so well I felt as if I were there walking down the street and seeing all the candles in the windows. Thanks for sharing. And a blessed New year to you and yours. Dear Mountain Mama - thank you so much for the generosity of your comments. Where in Wash State do you hail from? I spent a number of years just south of SeaTac as a child, and have such fond memories of the State. I'm in Florida right now, visiting with my Dad. But by all means, come back from time to time. I promise the occasional Irish 'fix'. And in that I live in County Meath, and know a number of Fitzpatrick's, I'll remember you as I write!